What could I expect from an album released on a budget label like Wyncote? 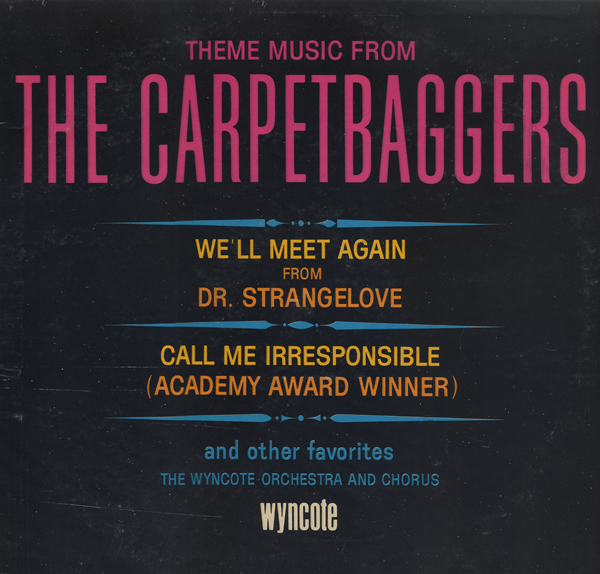 This cover is the worst and the group of musicians is named The Wyncote Orchestra? Exciting! 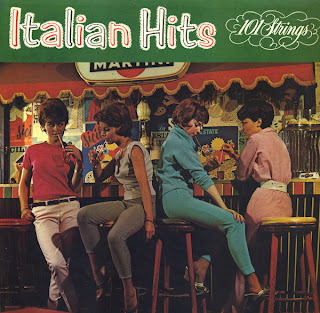 This is a pretty cool album! 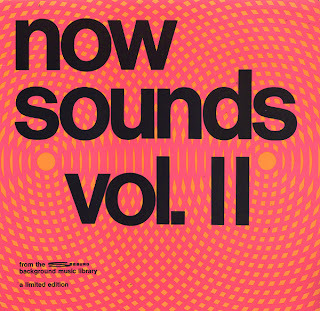 There are a number of light pop tunes on the album in addition to the dramatic example posted above. All but one of those songs (there is a dull track that finishes up the LP on the B side) are well done. Each song is unusually extended so there are only six tracks featured on the LP. This recording is one of the better non-tradition "island" albums that I have heard. The engineering is top-notch (the stereo release is worth looking for) as is the crystal clear guitar work of Paul which is a touch spacey and hip (no surprise there). I read one review that criticized the album for being two-dimensional and a "sleeper". All I can say is that the music reflects the Hawaiian folk tradition and paints a "sleepy" or dream-like tropical picture. The quirky space age cover art illustrates the first three tunes as listed on the cover. I take a lot of $1 gambles buying records found in the discount bins at record stores and thrift shops. Many records are so bland I have trouble finding something good to say about them. Today was a bland record day. My hopes were dashed and my spirits flat until I got around to listening to this set. 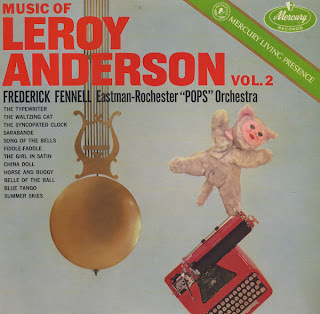 This is a somewhat obscure album and an awesome recording! The music is light Latin pop, 60s style, spiced up with bongos, mysterious spacey organ work, vibraphone and Kesner's Magic Stradivarius! The collection of instruments produces an unusual sound. It was hard to pick a sample as all the tracks are special and appealing. 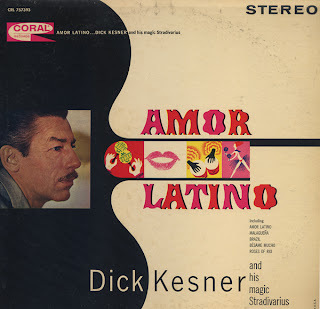 Even though I note promotions on the back cover of this album for six additional Kesner LPs (available on Coral), most of the references that I find to his work online are in association with his work on the Lawrence Welk Show from 1955 - 1960. I have to put this album up there with some of my all time favorite exotica/space age recordings. 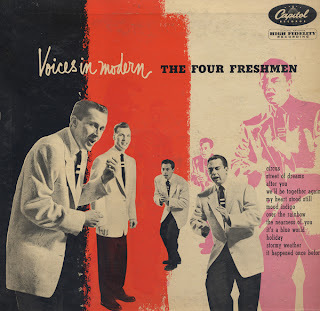 Apparently these jackets (in this series of Capitol 10 inch records) had the faux wood frame print glued to them and then, as needed, the illustration were added/fixed to the jacket. The High Fidelity Recording statement is a sticker. Not much info to be found on Scott. 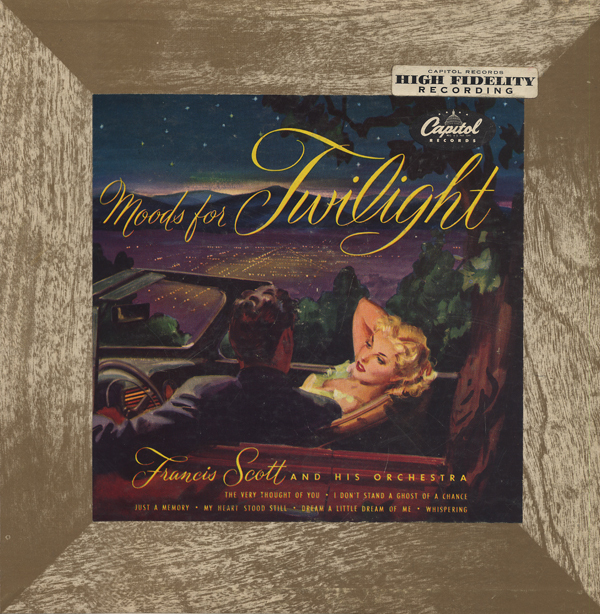 Apparently he made at least three "Moods For..." recordings including Moods for Candlelight and Moods For Firelight (which can be had for download on iTunes). Light pop Cha Cha from an obscure record and artist. The cover image appears to be an actual "club" sign, rather than a graphic. There are a few interesting tracks on this budget label release. Light pop and big band sound on the always interesting Omega label. Great vintage cover. One track, Jungle Drums is a stand out track and can be found as a download on Amazon. There are a number of cooking tracks on this set featuring unusual solo vocal work. Holiday and Stormy Weather are especially nice. Of course, It's A Blue World is also terrific! 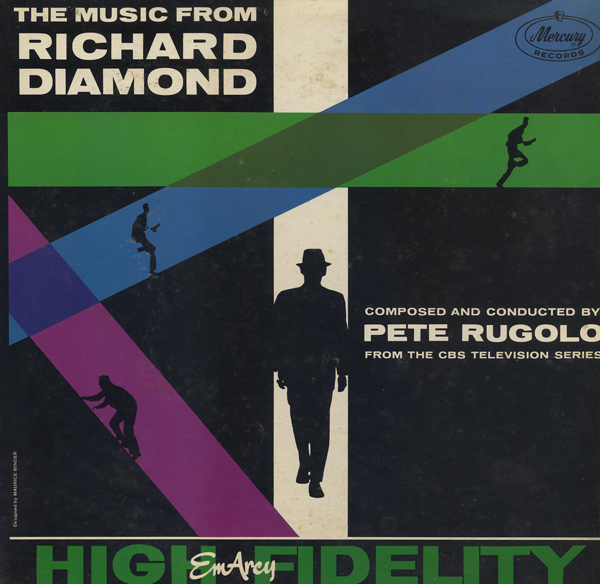 From Wikipedia: The third season featured a jazz score by Pete Rugolo, including a new theme. 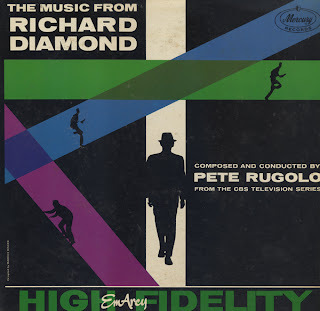 Richard Diamond was a detective drama that migrated from the radio to Television in 1957. The series ran until 1960. Rugolo also contributed music to Leave It To Beaver, Thriller, The Fugitive, Run For Your Life, Felony Squad, The Challengers, The Bold Ones, The Lawyers and Family. This is a GREAT recording that can be found online on CD or by the download. Here's a great obscure collector's item from The Seeburg Company who was best known for building Jukeboxes. 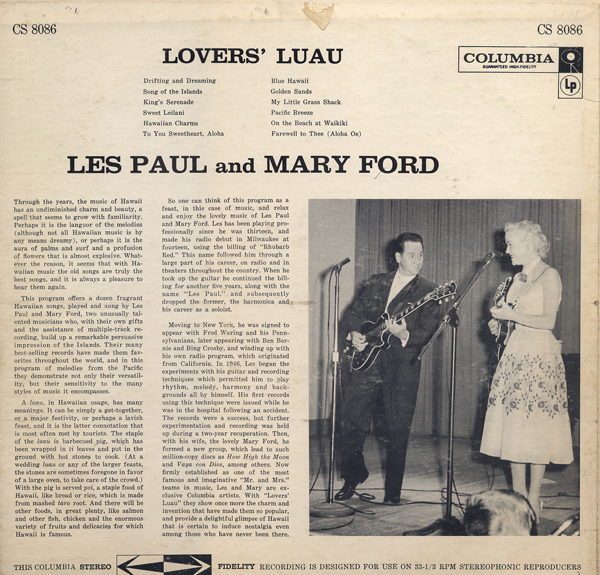 The jacket is marked: This Record Is Not For Sale - For Demonstration Purposes Only. 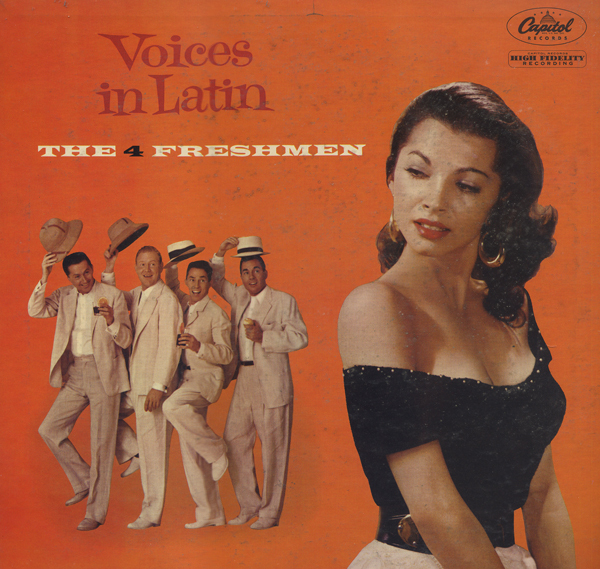 The disc is 33 1/3, but the music may also have been released on 16 RPM. 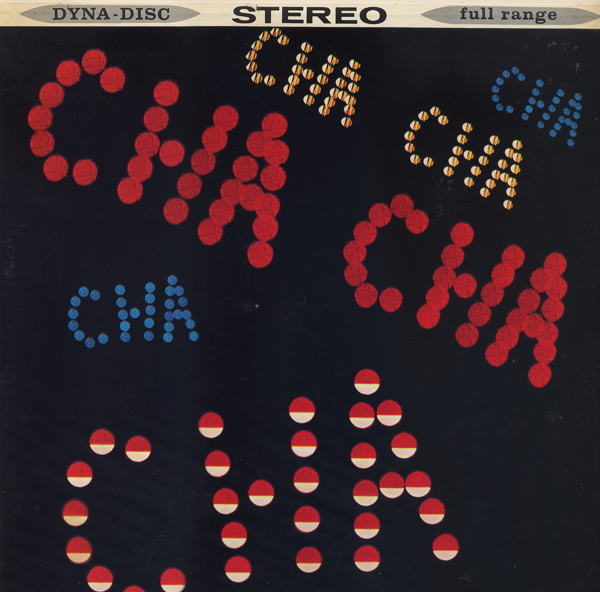 And Seeburg may have or have been trying to market a "system" of background music, which this record is only one sample. This product would have been in direct competition to what Muzak (a well established source for background music) was doing at the time. By The Time I Get To Phoenix (found on the disc) dates the record to the late 60s, probably after the Glen Campbell release in 1967. This album includes the titles Brazil and The Breeze And I. Everyone was cashing in on exotica or the Latin beat in the late 50s, early 60s including The Four Freshmen. Nice twist on the classics, and of course you get this great cover. 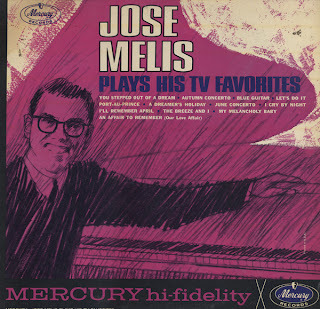 A few songs feature a jazz quality that keeps the disc interesting. Nice stuff. 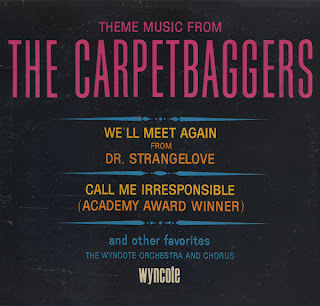 I found this record in the "soundtrack" bin. To the 20 something clerk that priced the album it must have appeared to be a soundtrack from the famous TV Show of the same name. I almost left it in the bin until I noted this wasn't "the" soundtrack, but covers of "spy" music by The Secret Agents. Of course, even today no one knows who The Secret Agents are, apparently the information is still classified. 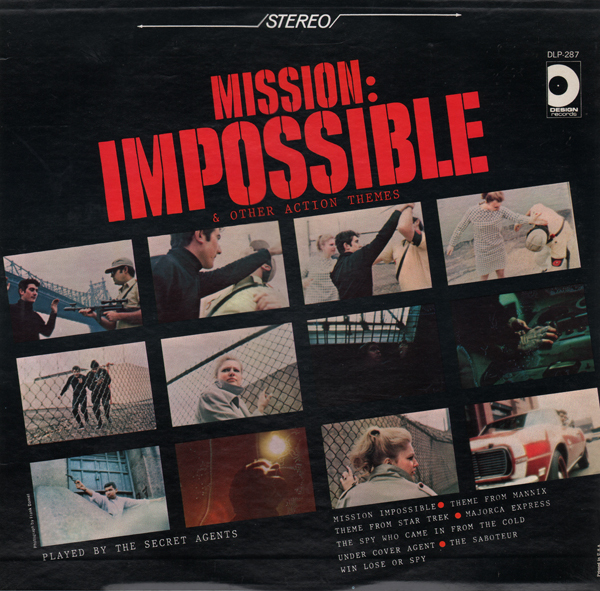 And why is the Theme From Star Trek mixed in with titles like The Saboteur, The Spy Who Came In From The Cold and Win Or Lose Spy? It doesn't matter, these are all groovy songs preformed by studio musicians who barely had enough time to practice before the recording session. The music is somewhat lackluster... in a good 60s low budget way! This is essentially a demonstration record. 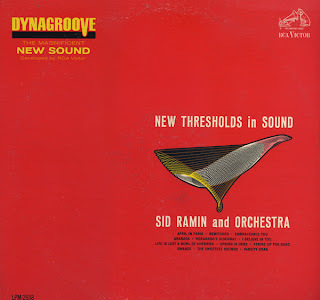 Sid Ramin was given marching orders to compose light pop, with lots of high/low frequency and quick tempo changes, or in other words, contrasts in an effort to impressively introduce Dynagroove technology. RCA used "electronic brains" (computers) to modify the audio signal fed to the recording stylus to make the groove shape conform to the tracing requirements of the playback stylus. Dynagroove recordings were mastered on Magnetic Tape. 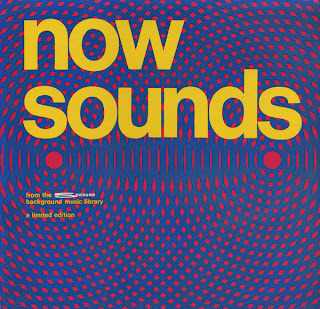 Dyangroove was not well received by some industry commentators and was discontinued, without fanfare in the late 1970s. 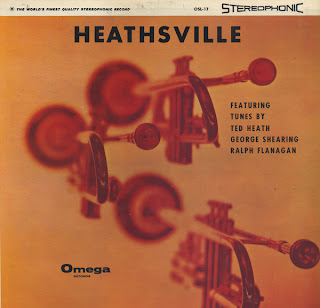 J. Gordon Holt, a noted audio engineer and writer of the 1960s and 70s claimed that Dynagroove introduced "pre-distortion" into the mastering process, making the records sound worse if they were played on high-quality phono systems. 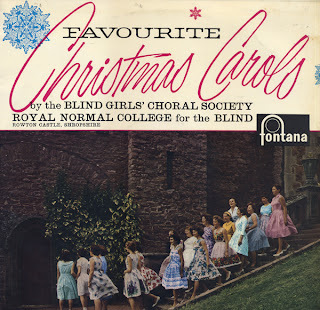 Strangely enough, this album (my copy) was released in 1963 in mono! The back cover is blank with the exception of a copy block that reveals nothing about the actual process of Dynagroove. All I can say, Command and Mercury releases of the same period, sound as good or better. The Supreme Secret. Mini skirts are a good thing. Obscure lounge title from Tops. 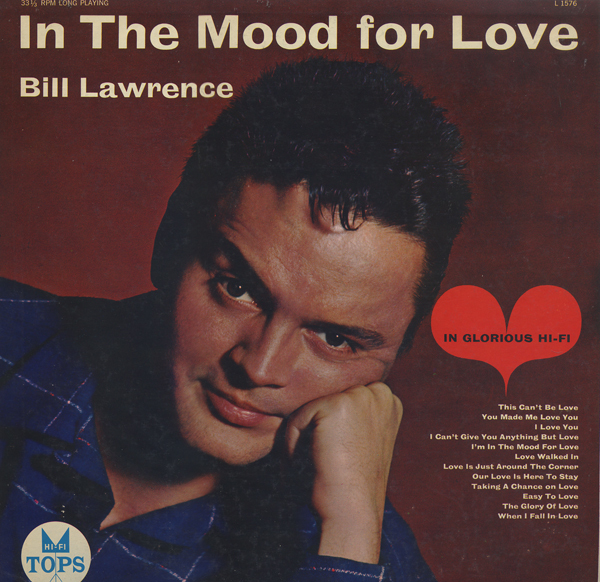 The album gimmick was to cover songs with the word "love" in the title. From the back cover: Bill Lawrence, one of the most exciting baritones on the scene today, has been pointing for a singing career ever since he made a lusty contribution to school and church plays. Even before he reached his teens, he was the prize of the local radio station of St. Louis, Mo. and the high spot on many an ameteur hour. Bill's first break came when he won an amateur contest at the Marcel Theatre in Los Angeles where he was ushering. Lawrence went on to front Jimmy Dorsey's band for seven months and then he won The Arthur Godfrey Show (talent contest) And then became regular guest (1949-50). This made "...him (Lawrence) one of the most spectacular stars in the world of popular music." And then straight into obscurity. Frankly, this happens to more talented people than you can count. Lusty contribution to school and church plays? The copy writer wasn't on Bill's side. Pleasant piano with orchestra album featuring few perky space age tunes and trademark quality Mercury engineering. Mary's Song is an original composition by The Blind Girls musical director, J. Eric Hunt. 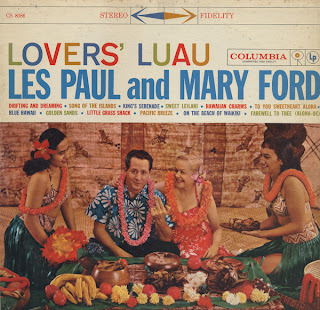 Stacked up against all my other "exotica" albums, this one is a gem. 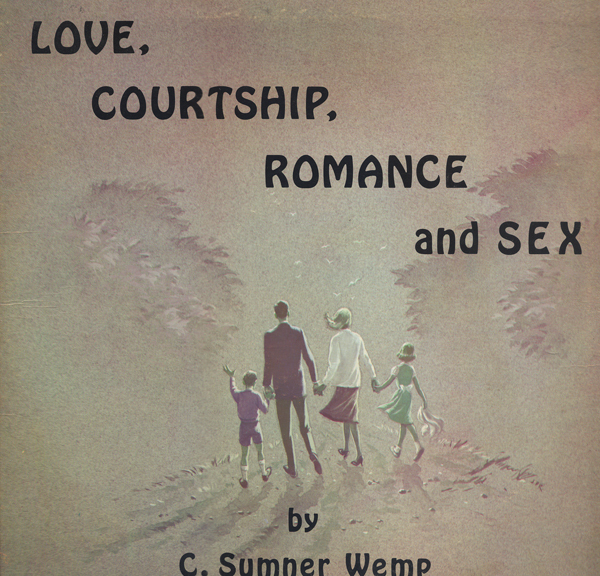 The release contains favorite titles such as Taboo and The Breeze And I. All tracks are lushly orchestrated to set a mood that reflects the cover art. 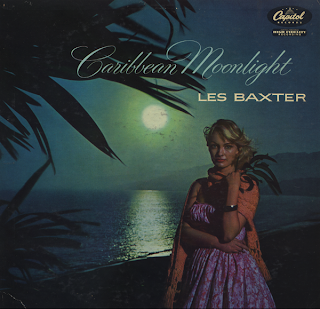 Baxter suggests, with instrumentation only, exotica effects such as bird calls and surf. Here's fantastic record packaged to appeal to "exotica" fans of the late 50s early 60s. 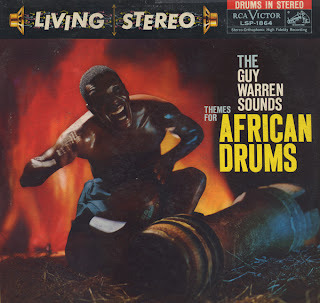 Guy Warren was born Warren Gamaliel Kpakpo Akwei in Accra on May 4, 1923. Read about Warren's extensive history on his wikipedia page. For this album (his second), he wanted blend African influences with voices, drums and a trombone (there are additional instruments used on the LP). He collaborated with the great trombone player Lawrence Brown. Brown told him what he was doing was not common in jazz and that it put him one step ahead. Some tunes seem straight forward folk, others are a blend of folk and jazz while others such as The Talking Drums Looks Ahead are just cool jazz."